When it was released in the Spring of 2011, Jodie Foster’s The Beaver – a title which is kept from being a crude double entendre thanks only to that one tiny definitive article – was overwhelmed and obliterated by the controversy surrounding its star, Mel Gibson, and vile remarks he made to his ex-girlfriend which were recorded and disseminated online. Whilst it would be disingenuous and wrong-headed to try to excuse Gibson’s actions, it’s a shame that a film as idiosyncratic and distinct as The Beaver was overshadowed by his actions. It’s unlikely that it would have found a particularly huge audience had it been released sans controversy, but it would have had a better chance to become something other than a footnote in a troubled actor's career. Gibson plays Walter Black, the chief executive of a toy company who has reached the absolutely nadir of a profound personal and professional crisis. When we first meet Walter, he is the final stages of a crippling, suffocating depression that is slowly destroying every part of his life. His company is in decline; his son Porter (Anton Yelchin) lists all the ways in which they are similar so that he can actively try to act like someone else; and his wife Meredith (Jodie Foster), after two years of trying to help Walter with his condition, finds herself left with no other option than to ask him to leave. Despondent and alone, Walter decides to kill himself in his nondescript hotel room. As with everything else in his life, ending it proves to be difficult. After trying to hang himself from the shower rail, only for the shower rail to break out of the wall, Walter stands on the edge of a balcony and prepares to take one last step. At the crucial moment he is stopped by a voice emanating from the end of his left-hand. 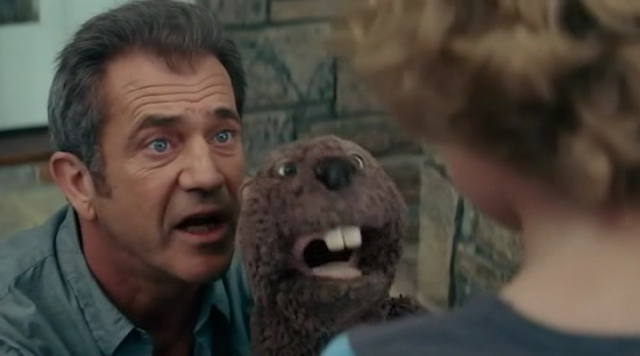 Earlier that evening, whilst throwing some of his possessions away to make room for another box of alcohol, Walter found an old stuffed Beaver puppet lying in a dumpster, which he then took with him. In his darkest moment, he decides to wear the puppet, and it is this puppet that stops him at the last possible moment. Once Walter sobers up, the puppet – who insists on being referred to as The Beaver – becomes Walter’s voice and life-coach, acting as a buffer between him and the world so that he can stand to live in it. At the heart of The Beaver is a tension between its high-concept premise and its pointedly realistic, often achingly sad depiction of serious depression. The contrast between the two is best exemplified by the last day of Walter’s old, pre-Beaver life and his first few days under the control of The Beaver. The opening montage of the film depicts Walter as an individual weighed down by constant, undefined psychic pain, and every detail of his sad spiralling life is related through bleak, unvarnished voiceover delivered in the “Australian Ray Winstone” tones of The Beaver itself. Yet once Walter allows this odd defence mechanism to take over his life, explaining to his family and co-workers that the puppet is part of a radical treatment prescribed to him by a psychiatrist, the film becomes downright loopy, with many scenes of The Beaver, voiced exuberantly by Gibson, interacting with real people being played for as broad comedy. As the story progresses and this solution to Walter's depression starts to be as troublesome as the illness itself, the scenes with The Beaver take on a darker edge in keeping with the rest of the film, but that initial transition is still very startling. It’s to Gibson’s credit that he is completely convincing when depicting Walter’s struggle under “the Heaviness”, to borrow a phrase from Rodney Dangerfield, of his depression (and it really does seem like Gibson is carrying some unseen but vast weight on his shoulders throughout the early scenes of the film), and at selling the comedy of, for example, Walter announcing The Beaver as the new CEO of his company. It’s also a great compliment to Jodie Foster as both co-star and director, since she displays a flair for comedy that might not be expected of such a great dramatic actor. Her choices in both modes of the film go a long way towards establishing a reality that encompasses both its sadness and its anarchic energy, creating a mood that is suitably bi-polar. A subplot about Porter Black selling essays to his fellow students, then getting involved with the valedictorian (a pre-megastardom Jennifer Lawrence) who wants him to write her speech for graduation also feels tacked on and unfocused, and serves mainly to distract from the core relationship between Meredith and Walter. Whilst it does serve to underline the idea that depression can spread to those in close proximity to it, as well as providing necessary conflict between father and son in order for catharsis to take root in the last act, it never feels essential and isn’t interesting enough to serve as a fun diversion. Not that this should take away from Yelchin or Lawrence, who are both very good given somewhat thin material. Even with those few missteps, The Beaver is an odd and fascinating film that uses its silly premise to Trojan Horse in a nuanced and intelligent depiction of depression and its effects on both sufferers and those around them. It’s a turbulent and at times difficult film, but one that is ultimately rewarding. Hopefully it will one day escape the unfortunate legacy of its star and be appreciated as the distinctive film that it is.